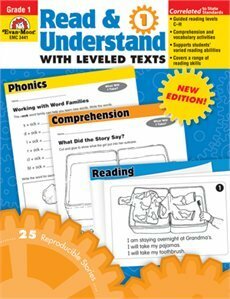 The 25 short and fun reading selections in Read and Understand with Leveled Texts, Grade 1 are leveled according to guided reading criteria so you can easily match texts to students' abilities. Reading selections cover reading levels Câ€"H and are accompanied by follow-up activities for comprehension, vocabulary, and other reading skills. Skills covered in grade 1 include: Letter/Sound Association Predicting Inferring Word Families Following Directions Relating Prior Knowledge Recalling Story Details Sequencing Using Context Clues Using Complete Sentences Organizing Information ... and more! This resource contains teacher support pages, reproducible student pages, and an answer key. View More In Display Booths.